Yesterday I had a lovely leisurely day, though the morning and early afternoon was a bit of an accident. I went down to a part of Toronto that I've never been to in the daylight to pick up some antique-y art for my cousin. Thinking I had my day planned out perfectly, I made my way downtown around 11 am only to realize that the store I needed didn't open until 2. Being pretty happy after some good news in the morning (two interviews for nursing jobs!! ), I made the best of a beautiful day and wandered around the city. 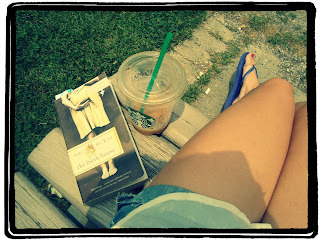 I went into Trinity-Bellwoods Park for the first time ever and sat and read my book for awhile. Then my friend came over and we made a ton of jello shooters for this weekend. We're off to a friend's cottage to enjoy the sunshine and to celebrate Canada Day. One type of jello shooter I've wanted to try for awhile is the orange slice shooter. I found a recipe for pink lemonade and we made them in both lemons and oranges. It's actually a lot easier than I was expecting. So if you're looking for a twist on jello shots, give this one a whirl. Hollow out 8 lemon halves. In a saucepan, sprinkle 2 pkgs of gelatin over 1 cup of pink lemonade and let sit for 2 minutes. Heat over low heat until the gelatin has dissolved, about 5 minutes. Add in 1 cup vodka. Pour into lemon halves (make sure they're well balanced or they WILL spill over) and refrigerate until set. Have a good long weekend and a happy Canada Day!